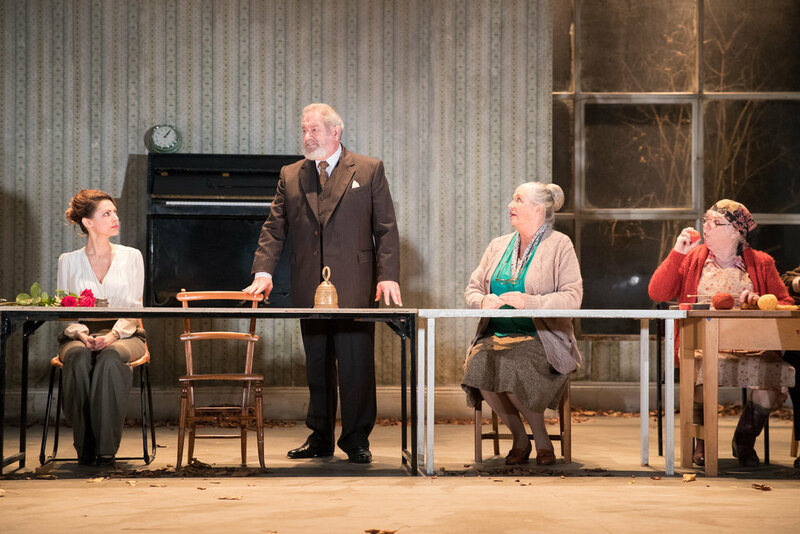 Yelena (Hara Yannas), Prof Serebrayakov (David Fleeshman), Maria (Joanna McCallum), and Marina (Carol Macready) in Uncle Vanya. Presented by HOME (3rd - 25th Nov 2017) || Photo by Jonathan Keenan. The inhabitants of a country estate on the verge of ruin one autumn day in 19th Century Russia are at war with their past, present and future selves. Barely keeping afloat in the lethargic, self-loathing yet hopeful cocktail they’ve made for themselves, these characters are sure to hold up a mirror not only to themselves but also the audience in HOME’s production of Anton Chekhov’s Uncle Vanya* (3rd - 25th Nov 2017). Uncle Vanya (Nick Holder) and Dr Astrov (Jason Merrells) in Uncle Vanya. Presented by HOME (3rd - 25th Nov 2017) || Photo by Jonathan Keenan. Dwarfing decaying walls, bottomless bottles of vodka and a hovering possessed piano fence in this particular story which, written 20 years prior to the Russian Revolution (1917), does not at all feel alien in today’s world. 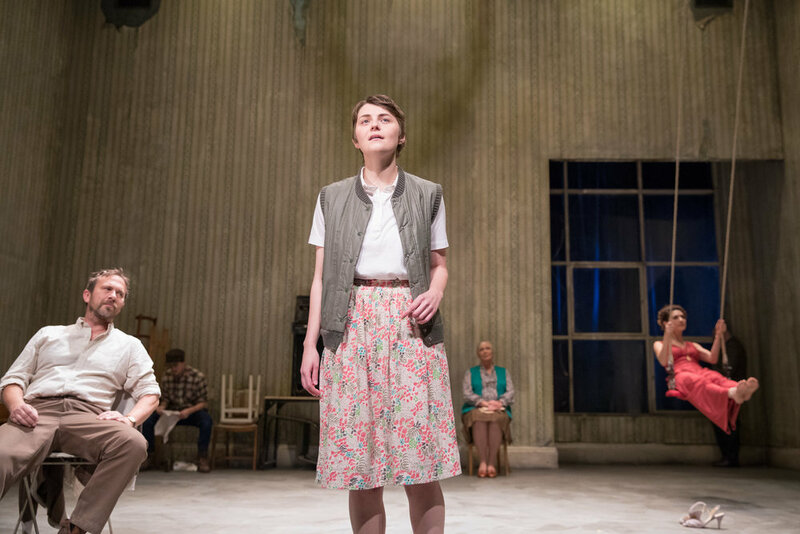 Depression, social class, identity, covetousness, environmental sustainability and pride are but a handful of themes explored in a way that seamlessly hands you multiple humorous moments of respite in amongst the darkness revolving around Uncle Vanya. Directed by Walter Meierjohann, this retelling which is based on Andrew Upton’s adaptation of the play, unfolds without haste to a hauntingly beautiful, melancholic lullaby composed by Marc Tritschler that could very well be another cause for the general decline of its characters’ desire to do more. Astrov (Jason Merrells), Labourer (Joseph Hardy, background), Sonya (Katie West), Maria (Joanna McCallum, background), and Yelena (Hara Yannas, background) in Uncle Vanya. Presented by HOME (3rd - 25th Nov 2017) || Photo by Jonathan Keenan. Alongside his altruistic niece, Sonya (Katie West), the industrious and highly opinionated Uncle Vanya (Nick Holder) manages his sister’s estate unchangingly until the sudden arrival of Sonya’s father, the pompous Professor Serebrayakov (David Fleeshman) and his wistful new wife, Yelena (Hara Yannas) who, unknowingly, alter the seemingly monotonous habits of those dwelling in and visiting this country estate for the worse. When the once-revered professor’s gout leads to the respected, environmentally conscious Dr Astrov (Jason Merrells) being called in, the estate is pushed even further off-kilter. Emotions run high and low in almost perfect unison; there’s a palpable yearning for love, for more, for normalcy, for being noticed, for rest which can be felt throughout the performance resulting in an ever-present whiff of hope in spite of the gloominess of this tragicomedy. And although things may be in disarray, one cannot deny the fact the overall earthy colour scheme, unifying both the stage and its characters, infuses a subtle sense of balance amongst the chaos which is in part due to the brilliant work of set designer, Steffi Wurster. Marina (Carol Macready) and Telegin (Kriss Dosanjh) in Uncle Vanya. Presented by HOME (3rd - 25th Nov 2017) || Photo by Jonathan Keenan. Drunken nights with boxers on show, arguments invoking the firing of guns and multiple shades of romantic encounters are but a few passionate scenes to look forward to. The cast give such powerful performances that you warm to the brooding characters with ease despite being given but a snapshot of their daily lives. It is hard to say which character is my favourite but if I had to chose, I think it might be Marina (aka Nanny) - we both share a fondness for noodles and a good cup of tea. This emotion-led play is riddled with enchantingly complex characters who, in facing some of their demons, create a tangible sense of sameness which easily breaths through the fourth wall and invites us to recognise a bit of ourselves in them - I swear at times it felt like I was playing the role of the understanding and dependable imaginary best friend which was kind of cool. If this at all sounds like something you would like to see, you can still catch it at HOME as it runs until next week Saturday (25th Nov) as part of their Autumn/ Winter season event: 'A Revolution Betrayed? '.